Hayden growing into her new ride! You “what the f****’d” my daughter twice! 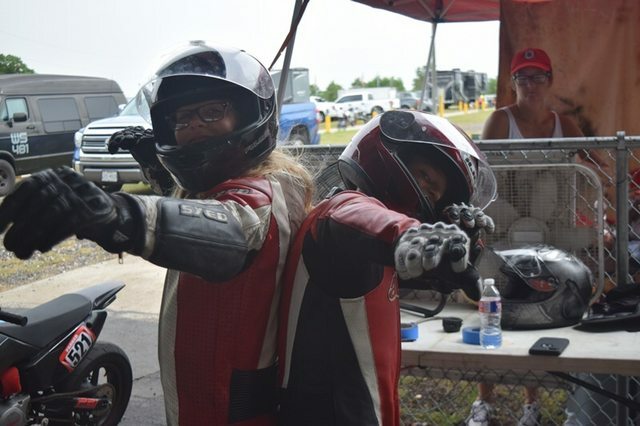 For her first time at the track, and 2nd day on that bike—-not bad. Oh yea, you might wanna get more powa, Parker might be on another SSR very soon. He usually laps around two seconds a lap quicker. Think she got a little aggressive after being bullied off the track earlier. I’ll talk to her about bikes “showing her a wheel”. IS this a grown adult "Da fuq'ing" a child? Was this an endurance race obviously? He’s cool and actually a good guy. Hayden is a hard pass, and I can see people getting frustrated by being out motored by a 65lb child. She got punted off the track earlier and combined with her rough off the weekend before she is getting more aggressive. This is actually a great learning video. Her lines are a bit off and she is concerned with protecting her inside. We got some work to do. The video was a sprint race. Yea she definitely surprised me with the passes going into T4, I thought both times that she wasn't gonna make the turn. 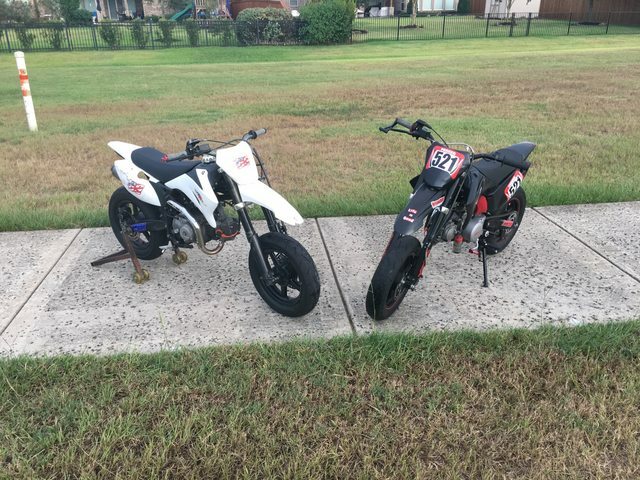 And in regards to powa lol, my bike was running like this wknd, you can hear it sputtering coming out of T2 and into T3..
And we're going to work on finishing the corner. She's still drifting back inside and wasting valuable space going into the next corners. WAIT, why do I want to make them faster? Oh yeah, safety. he he. She did great at making very hard for him to pass. 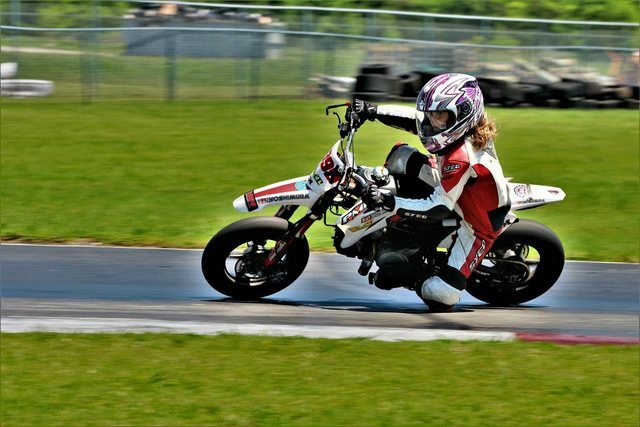 This is racing and she didnt give anything up. If they want to pass then they have to work for it. Kids continue to improve. Instead of chasing the train, they are IN the train. Parker’s bike still down on power, but we are working on it. I’m happy that they have flagged their starts as something to improve. These kids are just phenomenal. 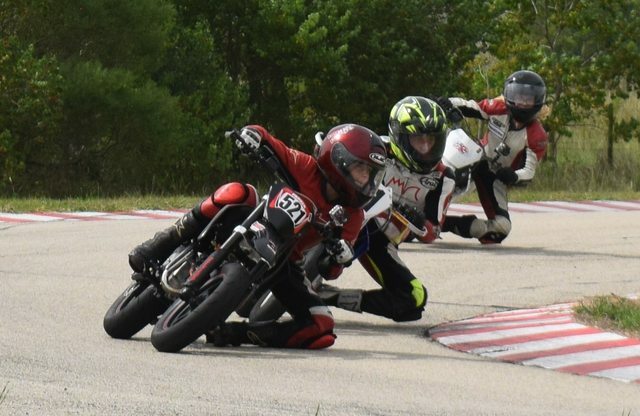 If you have a chance stop into a race and watch the Junior Motard race. Kids have been hard at work. Parker has been getting the best of his big sister so when his 50 fell ill, it was a great time to refresh and update their 50’s. Hayden is not much into the nuts and bolts but suddenly became very involved to make sure her bike was going to be equal to his. 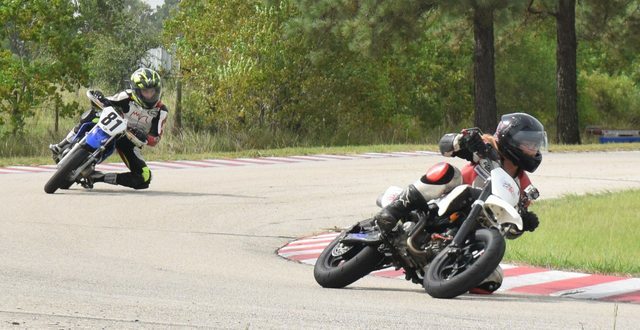 I’m going to be very interested in the outcome of the TMGP 50 race. Parker is such a technician and has studied others 50’s to figure out how guys three times his weight are beating him. Hayden is a bit more emotional and vocal (don’t know where she gets that from) but is certainly supportive of her bike being faster. To sit back and watch them work together on bike set up and strategy makes for a great feeling! 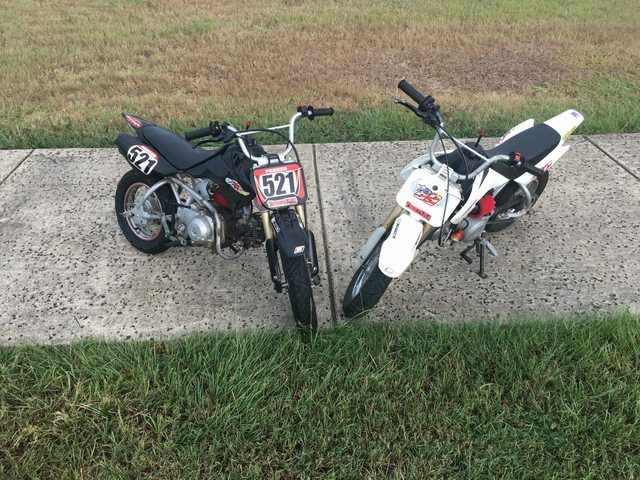 Both of them are becoming very aware of sponsorship and the cost of racing. Clean bikes and only putting stickers of those who have helped them are now a priority. These SSR’s are phenomenal weapons for the budget minded racer. Once set up, it’s basically twist and go. Each bike crashes well and parts are had quickly and cheaply. Kids are surprising me with their understanding of acceleration vs. top speed with their sprocket choice. Kids slowly inserting themselves on the podium! 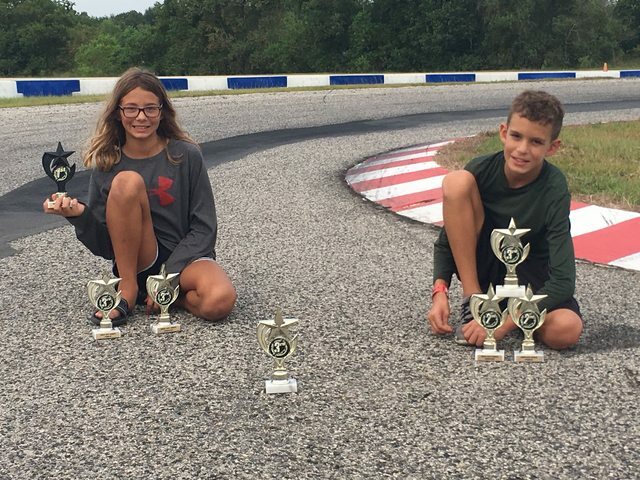 Parker rested on his last race accomplishments and learns a tough lesson. Hayden put in some work to improve but couldn’t get around them. These bikes are so even, which makes their races so fun to watch. This little lady has been putting in the work. Looks like you guys are having a blast out there ! Tell the kids ages again ? Parker is 9 on the black SSR. Hayden is 11 on the white SSR. Possibly my fastest kid isn’t old enough to race yet! He looks really good at practice. Awesome!....what are a good set of tires for a 50? 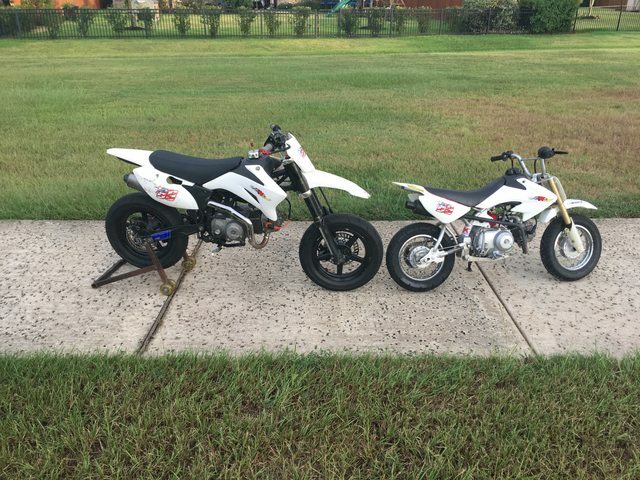 my 4 year old wants to know....i'm picking up a Grom this weekend and buying a katy track membership to hopefully keep his interest in riding and have a little fun myself. 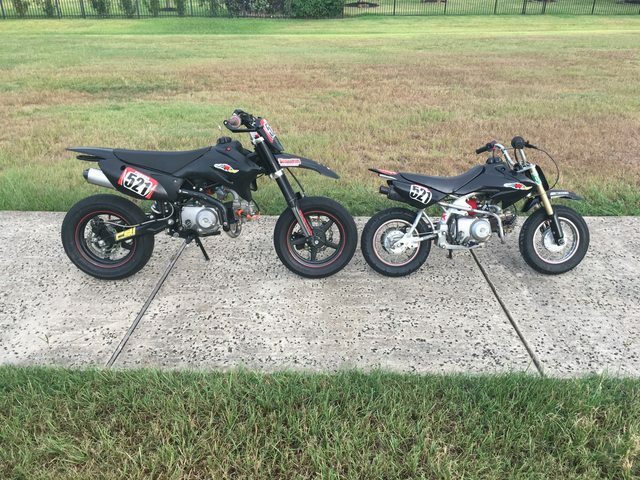 What age did your kids start practicing on the track? My youngest started at the kart track at 6. But they can’t race until 8. There are some cheap Kendall tires you can get but at a certain level the kids started losing confidence in them. We upgraded to the following which will mount to the stock 10” rims. My kids basically live at the Katy track, let us know when you want to go!